let me back up. We were having a discussion about bugs and he asked if people ever eat bugs. I said most people we know do not eat bugs, but explained that there are cultures in which bug eating is the norm. He then said that he wanted to try eating bugs. I went into mommy research mode and found a restaurant called Typhoon, housed at the Santa Monica airport that serves up a plethora of bugs! I picked Doodle up early from school and we scanned the menu. Our choices were: grubs, ants, crickets and scorpions. Without hesitation, he chose scorpions. 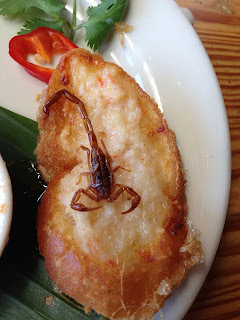 Two fried scorpions arrived on toast and he wolfed it down. But after one he was done. Then he made me take a bite out of the other one. It kinda tasted like a french fry.